This is one of my goals for this year. I am going to refer back to this to remind me that I’m not the only one who makes frustrated noises. First, I must buy a machine. 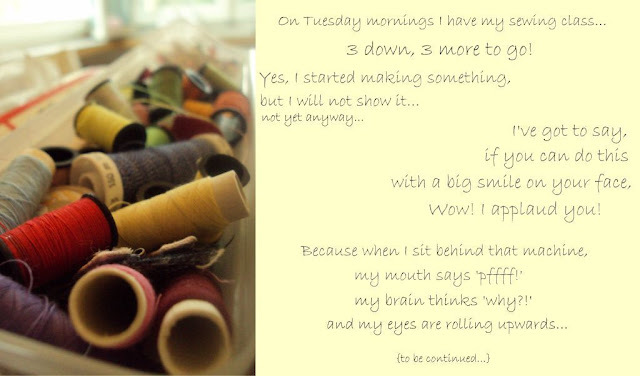 I absolutely am the worst ever about sewing….so, I continue thinking that you’re mi idle, Maureen!!! Good luck with your classes, can’t wait to see what your’ve been creating! It’s much less stressful sewing at home as you can take more time and have more breaks! Hi Maureen ~ I’ve become a lifetime sewing class student but it’s still not coming to me naturally! Good Luck! LOL! I admire you as well, because I am so hopeless at sewing, which is such a shame, as my mum used to be a beautiful tailoress. She made stunning outfits, and made all my clothes up until I was about 25. Her clothes were as beautifully finished on the inside as they were on the outside. Good luck with your project!! keep going…i’m sending you inspiration through the post!!! PS a long email is following – i think i have come down with ella’s virus…i’m feeling pretty average!!! Keep at it Maureen you will be triumphant!! looking forward to seeing your first attempt I am sure it will be gorgeous!! I love sewing! I want to sew a bag for myself!!! Maureen, I think I make the same pffft noise as you when I go near my machine. I love the idea of sewing, but it takes me so long to get started and I lose patience so quickly. Well done for taking a class. Thanks for your comment on my last post.